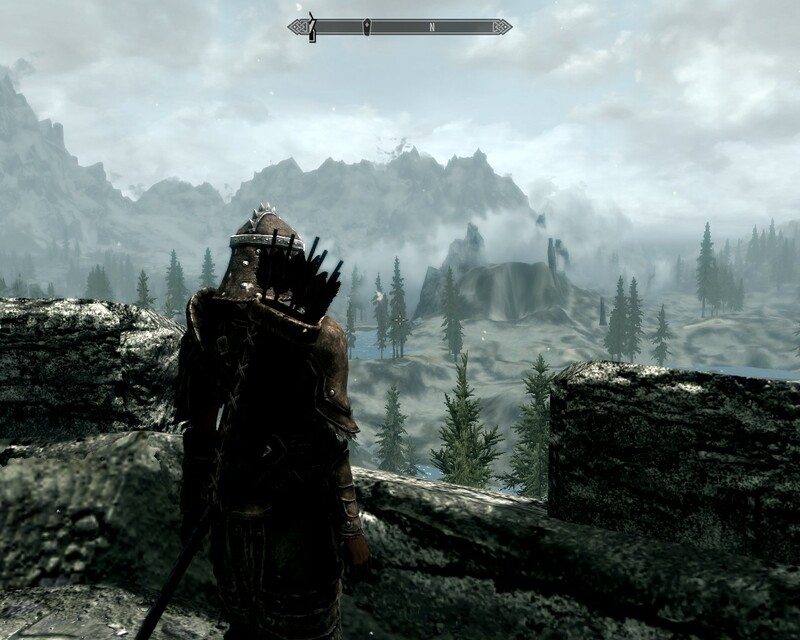 So, picked up this little game called Skyrim. I was expecting a Falloutized Oblivion, and that’s pretty much what it is. It’s quite a bit grimmer, and it improves on the RPG experience in countless ways. Starting with: it’s damn pretty. I thought Oblivion was pretty at the time, but that was five years ago, and if you go back to it now, the people look doughy, the dungeons are repetitive, and it just doesn’t look as detailed. Skyrim looks much better, and they’ve done amazing things with lighting, snow, and water… I always stop and stare at the water, they’re really good at bubbling streams now. The palette could be more varied… it seems like everything is brown and gray. I wanted to continue with dunmers, but they’ve run all the elves through an extreme uglifier. I adjusted about every slider, and my dunmer woman pretty much looked like my grandfather, only not as cute. So I started over as a Redguard. Restarting is annoying, because you start in a long movie which is great the first time but which you can’t skip– a really poor gameplay mechanic in a game that many players will want to replay several times. 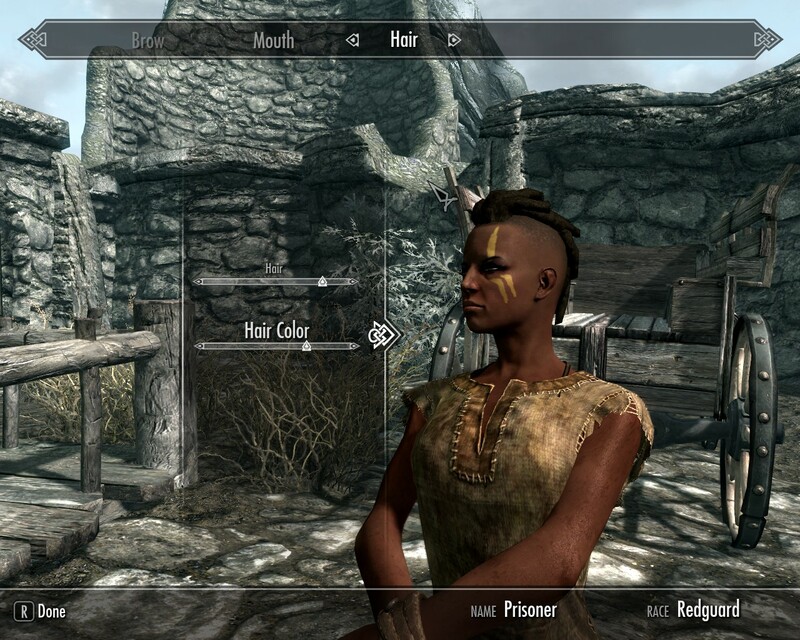 Savvy players will create a quicksave just before the character creation process. The UI is mostly better than Oblivion, and has some nice touches like rotatable models (and in at least one quest you have to rotate an item to learn more about it). On the other hand you can’t see your character as you change apparel, which is dumb, and the perk changing screens are awful. Combat is more interesting, as it’s based on use of both hands. You can strike + block; you can double weild; you can use a weapon + magic; you can use magic + magic; or you can use a two-handed weapon. These are interesting choices, and you can develop them further with perks– e.g. wield two Destruction spells at once, plus a perk that makes such doubled spells more effective. I’ve been relying a lot on a sword plus a destruction spell. There’s a favorites menu, which you can supplement with hotkeys, though I have a tendency to fumble these in the heat of battle. There is probably an optimal leveling strategy, but screw that, I just play, and pretty often you get the happy sound of a skill being raised as you use it. Apparently monsters will level Fallout-style; that is, areas you’ve already been to won’t level with you. The AI for magicians seems way better than Oblivion. They’re dual wield too, and that can be pretty devastating. I’ve found that using dual magic back doesn’t work so well… go up close and show them some steel. There’s just a lot of little things that have been tweaked or improved. The book reading animation is nicer. You can catch butterflies and lightning bugs. You can cook things or improve your armor or disenchant a weapon to grab its magic. You can play hide and seek with the kids. But above all, NPC interaction is a lot more satisfying. Haven’t heard them talk about mud crabs yet. There’s a much wider variety of things people say, and it’s more contextual… e.g. people will react to you based on what you’re wearing… or not wearing. Many spells, including healing and the destruction spells, require you to hold down the mouse key, not just tap it. I was really pissed at the game till I figured this out. No mortars and pestles; instead you have to use alchemy tables. The first one you’ll see is probably the one in the castle at Whiterun. Companions = fighters’ guild; Winterhold = mages’ guild. There is a clever moment in the intro when you get a choice of whether to follow an Imperial or a rebel. You may not even notice that two people are calling to you. It doesn’t matter which you pick– it’s not a permanent choice. It’s really video game heaven right now: in addition to Skyrim I’ve been playing the free MMO DC Universe Online, plus I have Dead Space 2, plus Arkham City is coming out soon.